Blowout Sale! Free Shipping Included! Save 62% on the Carlisle 41202 White Melamine Straight-Sided Ramekin (Case of 48) by Carlisle at Just Gathering. MPN: 41202. Hurry! Limited time offer. Offer valid only while supplies last. The Carlisle 41202 melamine straight-sided ramekin is round, white, and suitable for holding and serving sauces, condiments, desserts, or other food. 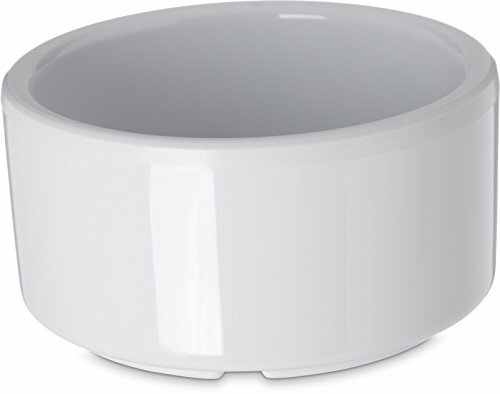 The Carlisle 41202 melamine straight-sided ramekin is round, white, and suitable for holding and serving sauces, condiments, desserts, or other food. The ramekin is made of melamine resin for its drying properties, durability, and resistance to heat. It has straight sides for appearance. Two or more ramekins can be stacked for storage. The ramekin measures 1.50"/3.81 cm high and 3.00"/7.62 cm in diameter and has a 3.00 oz./0.09 liter capacity. The ramekin is dishwasher-safe and withstands temperatures up to 212 degrees F. It meets NSF International/American National Standards Institute (ANSI) Standard 36 for dinnerware.